Description: In all its natural beauty, a bouquet of blossoming flowers in Peach, Tangerine and Yellow hues bloom while surrounded by radiant Willow Green leaves and glistening Multicolored Rippled glass. This lamp is so beautiful that you will think you are sitting in an English Garden. 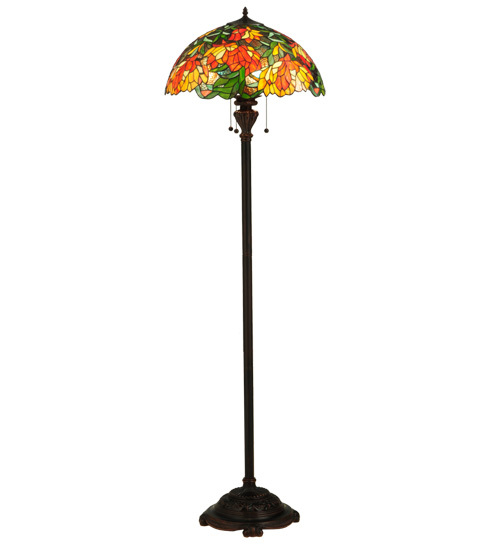 This stunning Tiffany styled stained glass shade, with a coordinating floor base in a warm Mahogany Bronze finish, will add a brilliant, luxurious elegance to your home.